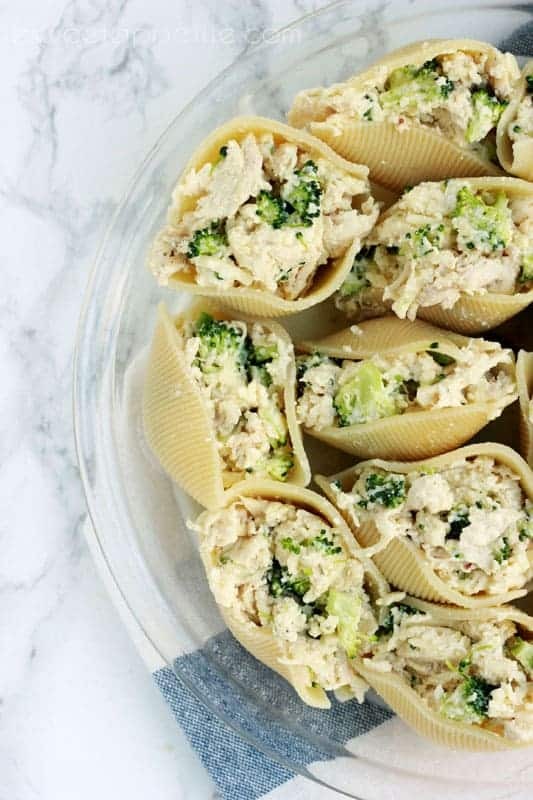 Whip up these Chicken Alfredo Stuffed Shells for a quick weeknight dinner! One of, if not THE, most popular recipes on my site has to be my Lasagna Stuffed Shells. I don’t know what it was about them but you all have pinned and visited over and over again. I’ll admit that they are actually one of my favorite dinners to make and leftovers don’t last long. I decided that it was time to make a new version but wasn’t sure where to even start. I headed to the fridge and found chicken and instantly knew it would be a good base. I wracked my brain and talked with my other half and finally decided that adding in a veggie would be a good idea. Broccoli was the obvious choice and to switch it up a bit I replaced the tomato sauce with a simple Alfredo. We made a simple homemade version, but you can skip that step and buy a jar from the store too. Both are equally delicious. When I first served these to the family I was met with the wonderful sound of gagging from my six year old. I have never had him throw such a fit over dinner. Pasta isn’t his favorite and I think the white sauce threw him for a loop. It took me five minutes of “Take a bite” and “Daxton, just eat it” before he finally caved and stuffed his little mouth full. I’m pretty sure he was ready to prove me wrong and show me that it didn’t taste good at all but his expression went from grossed out to giant smile in less than two seconds. He immediately changed his tune and scarfed down three shells in no time. This dish has jumped to the top of his all-time-favorites and it’s pretty high on mine as well! I especially like that it’s packed with broccoli for that extra little dose of good. 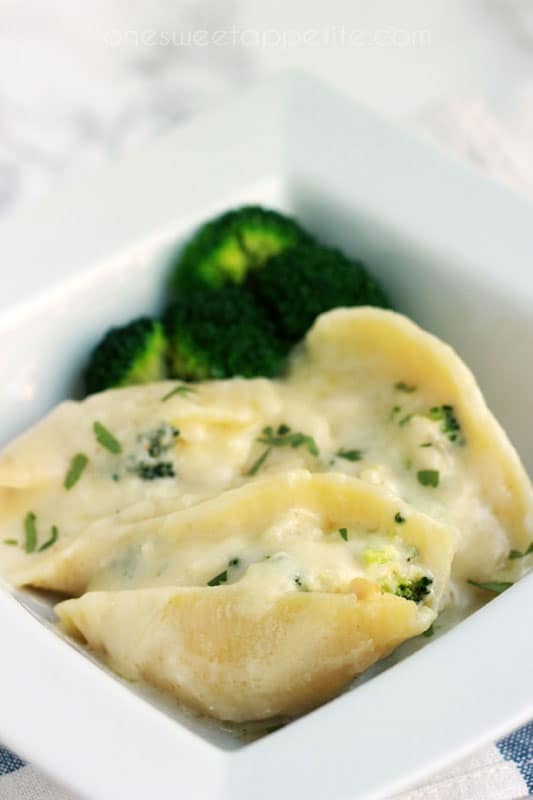 *For a quick homemade Alfredo… Melt 1 tablespoon of butter in a saucepan. Whisk in 1 garlic clove and 1 tablespoon flour. Stir in milk and cook until slightly thickened. Remove from the heat and stir in 3/4 cup freshly grated Parmesan and 1/4 teaspoon pepper. Preheat your oven to 350 degrees. Lightly mist a 9x9 dish with cooking spray. Spoon 1/2 cup Alfredo sauce on the bottom of the pan. In a large bowl combine the chicken, ricotta, 1/2 cup mozzarella cheese, Parmesan, egg, broccoli, and 1/2 cup Alfredo. Spoon into your cooked shells and place each in your pan. Spread the remaining sauce over the shells and sprinkle with the 1/2 cup mozzarella cheese. Cover and bake 20 minutes. Uncover and cook an additional 10 minutes. 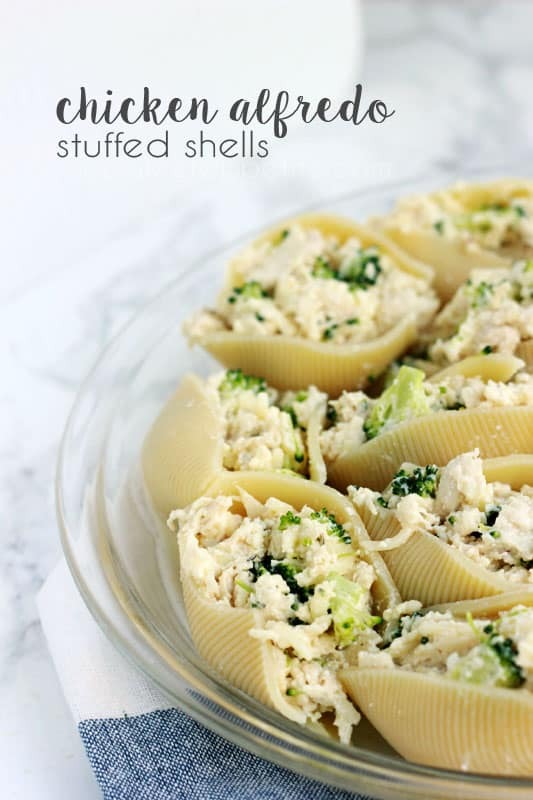 You know me and my love for stuffed shells, I just HAVE to try this alfredo version. Yum! It’s SO good. Make homemade alfredo if you make them. So much better. Also, you need to try my lasagna stuffed shells. The original photos are terrible but it’s one of our all time favorite meals.